Phil Cousineau is exhausted. The award-winning documentarian, teacher, storyteller, photographer, and author--who certainly ought to be worn out, if only from carrying the weight of so many hats on his head--has only been back home in San Francisco for 12 hours, following a long week of bicoastal book-touring. Yet there he is, waiting--and yawning--on the steps of Grace Cathedral from whence we will embark on a rainy, two-hour drive to San Jose to catch an early-morning screening of The Fellowship of the Ring. And though the film, based on the first book of J. R. R. Tolkien's Lord of the Rings trilogy, is all of three hours long, Cousineau remains energized through every exciting second, not yawning once. In fact, it's all he can do to remember to breathe. When he finally does, it's to sigh "Unbelievable!" and "Magnificent!" as the film concludes. Moments later, on the way out of the theater, Cousineau stops to gaze at the eight foot high Lord of the Rings display standing in the lobby. There is the astonishing, expressive face of Frodo Baggins (Elijah Wood), Tolkien's unwilling hero, the fur-footed Hobbit whose task it is to destroy a golden ring so evil it could plunge his world into darkness. Looking over Frodo's shoulder are the assorted members of the fellowship of elves, dwarves, hobbits, and men that have formed to help him, most notably Gandalf the wizard (Ian McKellen), the young hobbit's mentor and spiritual guide. "This will turn out to be a very important film," says Cousineau, a widely recognized expert on myths, best known for his documentary, The Hero's Journey: The World of Joseph Campbell, and the best-selling book, Once and Future Myths: The Power of Ancient Stories in Modern Times. "In my studies of myth over the years, I've seen that at about the two-thirds point in all of our great classical myths and fairy tales, the hero or heroine has an opportunity, a choice, to make a decision to either be a victim of fate--or to turn fate into destiny," Cousineau observes. 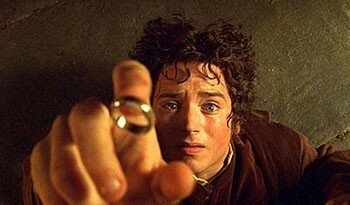 "In this story, Frodo--this wonderful young boy--has to make that decision repeatedly," he continues. "To turn his fate into destiny, or turn his back. Those moments are part of what make this one of the most powerful films of the last decade." Slowly, almost reluctantly, Cousineau forces his eyes away from Frodo's half-panicked, half-determined face. With that we embark on a quest for lunch. "At the heart of this story," Cousineau says 30 minutes later, as a mostly untouched plate of pasta waits on the table before him, "underneath the story of Frodo the hobbit, is the eternal fascination and obsession with the source of evil. What do we do about it in every generation? Will it overwhelm us, or will someone have the courage to go through the dark night of the soul, to enter the dark forest, to go down into the underworld to defeat the monstrous source of evil?" "The deep fascination that exists in all of our hero literature, all of our quest stories, is the question, 'Will I have what it takes when that moment is here for me?' 'Will I be just a victim of fate, or will I turn fate into destiny?'" From the December 27, 2001-January 2, 2002 issue of the Northern California Bohemian.